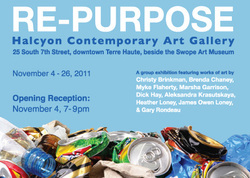 The Halcyon hosted a show entitled "Re-Purpose", with a theme of using recycled everyday items. This show is about art, not jewelry, so I explored some new directions with origami using recycled paper. I created a series of canvas and shadow boxed items, incorporating origami insects folded entirely from political junk mail. The Baltimore Clayworks is an art foundation dedicated to education and promotion of clay art in all its forms. In 2009 I was invited to participate in their first ever show featuring jewelry made from clay, along with two dozen artists from across the country. How does silver origami qualify as a clay art? The silver I use starts in a form called PMC, or Precious Metal Clay. This can be worked almost the same as the clay used for making ceramics. It can be formed, molded, carved, sanded, and even folded like paper when worked properly. When fired in a kiln, the binders burn off leaving .999 fine silver.